From left: Apprentice Tanner Dukelow, head mechanic Jason Button and apprentice Ben Morreau at JDW Truck and Trailer Repair. Cathy Dobson. Jason Button is head mechanic at Sarnia’s newest commercial truck and trailer repair shop in the former UBE building. Opening the shop to the general public is the newest business venture for JDW International Trucking, a local company that moved into a large portion of the former wheel manufacturing plant in 2015. “I was hired to set up this shop to service JDW’s trucks and now we’ve opened it to everyone,” said Button. He anticipates the majority of customers will be truckers travelling along Highway 402 who need to stop for a quick repair or for regular maintenance work. “We’ll service everything we can and get you back on the road quickly,” said Judy McKeegan, JDW’s safety director. JDW International Trucking, owned by Jeff and Victoria DeWolf, has operated in Sarnia for some time, first on Ontario Street, then on Telfer Road. About three years ago, the company moved to 21 Ube Dr. and is leasing a large portion of the former UBE plant near Chris Hadfield Airport. The JDW fleet has grown to 54 tractor-trailers, including four purchased this summer. Recently, JDW bought JMS Warehousing in Point Edward’s DMI Building where warehousing and cross-dock services are available. Other companies can drop off their freight at the JMS property, which is less than a kilometre from the border, so other carriers can pick them up, said McKeegan. “Our growth is obvious. We’re very multi-dimensional although our primary business is to carry general freight anywhere in North America,” she said. Aside from the four in the repair shop, JWD employs 53 drivers and 10 office staff. JDW’s presence at the former UBE plant means there’s finally a lot of activity in the city’s industrial park on the north side of Hwy 402. Japanese-owned UBE Automotive opened with great fanfare in 2002 but shut down in 2009 when the automobile manufacturing sector took a beating. The building was sold to an out-of-town company that intended to continue to make wheels but no contracts came in. In 2012, millions of dollars worth of manufacturing equipment was auctioned off and the plant stood virtually empty. Two local men purchased the building in 2015 but their identities have not been made public. Real estate representative Kenn Poore says JDW International rents “flex space” and sometimes occupies more than half the plant. There are a couple of other short term occupants in the building as well, said Poore. The city-owned business park still has 38 more acres available for development and the former plant has some additional space for lease, according to Poore. JDW’s Truck and Trailer Repair is located at the east end of the massive building where as many as three trucks and a trailer can be serviced at one time. Button runs the shop with licensed mechanic Tyler Sterling and apprentices Ben Morreau and Tanner Dukelow. It’s open six days a week from 6 a.m. – 8 p.m. Closed Sundays. 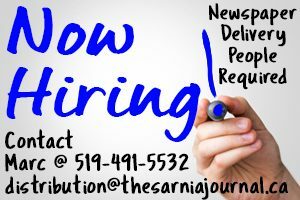 Call 519-383-6660.